When I was a girl growing up in California, whales fascinated me. It was the 1970s, the heyday of Greenpeace and knowing whales existed is inseparably entwined in my mind with the knowledge that these majestic creatures were being hunted to extinction. As soon as I could, I went to work for Greenpeace selling “Save the Whale” bumper stickers door to door. Since then, many species have rebounded and have been snatched from the jaws of oblivion. What does this have to do with your favorite summer tomato? Stick with me. Most people are aware that the extinction of animals is still a threat throughout the world but according to a study published by the Food and Agriculture Organization of the United Nations, we have also lost an astounding 75 percent of our plant species since 1900. 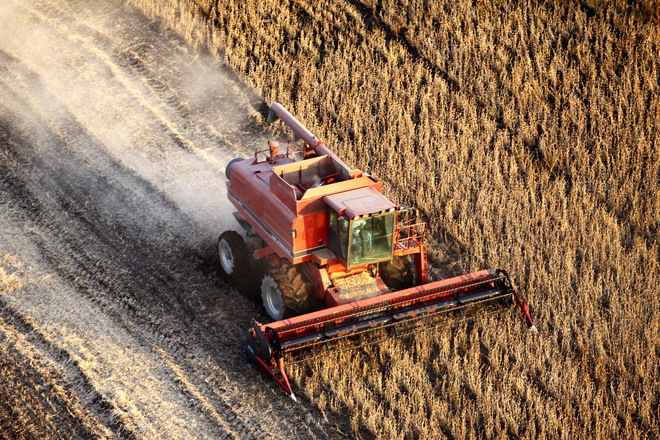 The advent of industrial agriculture has had a substantial impact. To save on cost and labor, vast single-crop fields are planted in the same place year after year, and genetically identical hybrids have been developed for higher yield and resistance to pests. This efficiency has come at a great cost. 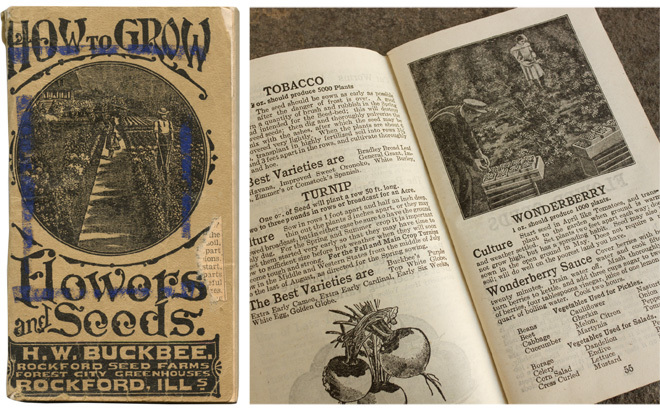 “How to Grow Flowers and Seeds,” a handbook published by Rockford Seed Farms in 1918. At right, a spread with information on the cultivation of tobacco, turnips, and wonderberries. As large corporations have gained control of seed production, the industrial hybrids have increasingly crowded out many of the local varieties farmers used to grow on their land. A 1903 seed catalog lists 400 varieties of pea — compare that to Burpee (a seed catalog in existence since 1881), which now lists 22. Our grandparents’ tables were laden with a selection of fruits and vegetables they grew themselves or that local farmers had success with, many would have been particular to their region. The U.N. report also reveals a staggering statistic about the lack of diversity in our eating habits: a whopping 60 percent of the calories obtained from plants for human consumption come from just three crops: rice, corn, and wheat. A tiny seed that produces a quirky variety of tomato may not seem as glamorous as a California condor or grey whale, but we should be every bit as concerned about its disappearance. These seeds that have been passed down for generations are called “heirloom” seeds for a good reason — they are extremely valuable. The rise of large single-crop fields in modern agriculture has resulted in a fall in the biodiversity of plant species. Image credit: flickr user JSmith Photo. Throughout most of human history, seed saving helped maintain farms and gardens. With a kind of human-assisted natural selection, the seeds from the best tasting and producing plants were saved and replanted, developing more and more dependable crops each year while weak varieties were bred out. The seeds were open-pollinated. In other words, the plants were pollinated by nature itself: birds, wind, and insects. They were genetically diverse because pollination between individual plants was not controlled. That’s a good thing, because as seeds are planted year after year they adapt to local conditions and become more resistant to pests. Unlike hybrid seeds, under the right conditions these open-pollinated seeds remain true-to-type, meaning they produce the same recognizable product year after year. These seeds traveled along with the huge diaspora of people as they moved from place to place in search of a better life, or sadly, with those who were forced to relocate. Immigrants often brought seeds with them even if they weren’t farmers because they provided the perfect little cultural package — small, portable, durable — a link back home and a promise of future sustenance. For variety alone, it would be sad to lose the heirloom seeds that our ancestors labored to pass down throughout the generations. Think of a cheese plate. When you put together a cheese platter, you try to include a variety of textures and flavors, an aged cheese like a Comté, a soft one like the luscious Brillat-Savarin, and an earthy blue Stilton. You wouldn’t want a platter that consisted of only commercially produced cheese like sliced American. Barry Estabrook, author of “Tomatoland: How Modern Industrial Agriculture Destroyed Our Most Alluring Fruit,” sees great value in growing heirlooms to create independence from corporate seed companies and maintain varieties. More than 100 heirloom tomato varieties are currently being grown and analyzed at the University of Florida in an attempt to breed taste back into industrial tomatoes. “If no one would have saved those seeds, the genes that create those tastes would have been lost,” says Estabrook. But there are many more reasons why we should be concerned with loss of diversity in the food supply. With the disappearance of these harvested plants, we also lose the culinary traditions associated with them. Collateral endangerment of animals that are a part of their ecosystem is lost as well. There is evidence that those vast fields of genetically identical crops, called monocultures, are a contributing factor of “colony collapse disorder” which is currently plaguing the honeybee. Recent studies have shown the bees are not able to get adequate nutrition from the drastically reduced diversity of plant life available to them. The more genetically diverse our food supply is, the safer it is. Monoculture agriculture leaves entire crops vulnerable to being wiped out. The blight that caused the infamous potato famine was present in other European countries, but it had a much more devastating effect on Ireland because unlike elsewhere, their crops consisted almost entirely of a single variety of potato, the Irish Lumper. Also raising an alarm is the fact that multi-national companies are increasingly monopolizing control of seed — and don’t even get me started on GMOs (genetically modified organisms). 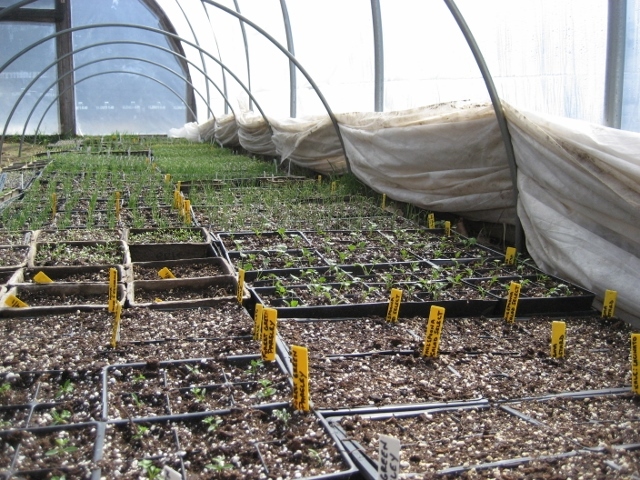 Seedlings beginning to grow in the hoop house at The Hudson Valley Seed Library. Image credit: Hudson Valley Seed Library. Seed Savers Exchange, a non-profit organization that maintains thousands of heirloom varieties, originated with the simple gift of seeds: Grandpa Ott’s morning glory and a tomato called German Pink. The seeds were brought from Germany by the founder’s great grandfather in the 1870s. Seed Savers Exchange and a rapidly growing number of other seed companies and nonprofits are working to preserve and share America’s endangered heirloom seeds and plants. Many seed saving organizations have a strong regional focus, like The Hudson Valley Seed Library, which sells seeds and starters native to the Northeast and also gives tours and classes on gardening and seed saving. 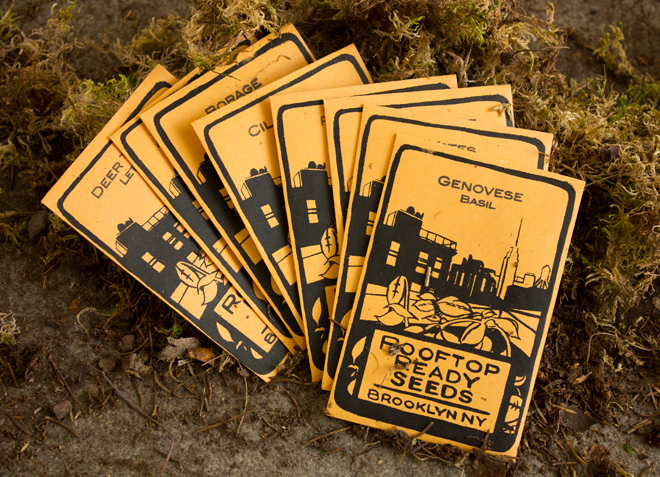 A collection of Rooftop Ready Seeds. Yellow and green heirloom squash. Image credit: flickr user Lawrence Farmers Market. 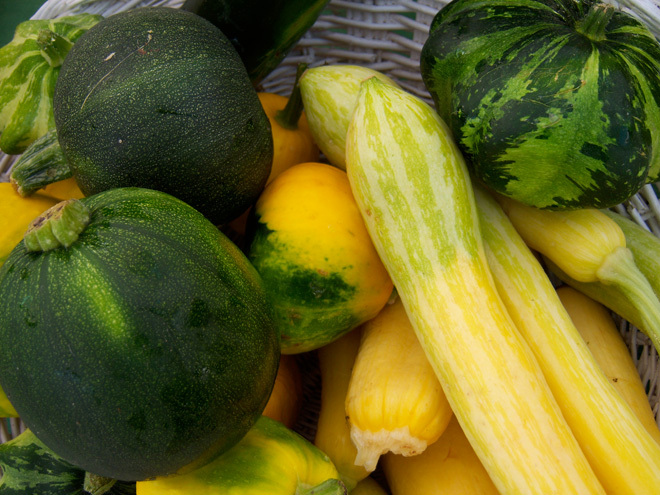 A Google image search of “heirloom squash” yields an eye-dazzling spectrum of colors — carroty orange, sunny yellow, dusky green. Textures and patterns abound from stripes and speckles to snaky or star-shaped. Nature seemingly has no limit to its playful production of form, shaping an endless array of different combinations. The sheer abundance appeals to my artistic sensibility in the same way the many different kinds of seashells delighted me as a child. And like the child I was, as an adult (and a gardener) I want to collect them all. I can plant, harvest, and cook some of these plants, saving seeds from my best producers to replant next year. And when I do, I will be contributing directly to their survival. And that gives me a much better feeling than selling bumper stickers. Not that there’s anything wrong with that.